This page features over 50+ crowns, hats, and headbands. You'll find birthday crowns, award headbands, as well as hats to feature your letter or number of the day. There are also holiday and season crowns. At the bottom of the page, we even have blank templates so you can create any crown you can imagine. For best results, print these crowns and hats on heavy card stock paper. Make a crown with the Letter A on it! There's a picture of an acorn, an apple, and an ant to color. Then trace the upper and lowercase letters. Create a beautiful Letter B hat to wear in school. On the front is a giant letter B, and pictures of a bird, a banana, and a beaver. This is the third crown in the set. It has illustrations of cheese, cake, and a chicken. D is for duck, deer, and donut. Trace the uppercase and lowercase Ds. Color, cut, assemble, and wear proudly. This headband sports the Letter E. It has an elephant, an ear, and two eggs. This fantastic crown has primary-ruled lines for tracing the Letter F. Graphics include a fish, a fan, and a fabulous flower. Here's a headband with a giant G on top. Illustrations of a goat, a glove, and grapes are shown on the front. A picture of a hat on a hat? Yes indeed! There's also a hook and a hot air balloon. Trace the capital and lowercase Letter Is. Color the igloo, iguana, and ice cream cone. Jump for joy when you wear this jolly J crown. On the front are pics of a jellyfish, a jar of jam, and jet. You'll look as dapper as a king with the K crown on your head! There's a kangaroo, a koala, and a kite pictures on the headband. The lovely Letter L crown has a log, a ladybug, and a lion. Trace the lowercase and capital letters on the band. Cut, color, glue, and wear! This magnificent headband sports the Letter M, as well as a muffin, two mice, and a map. Here's a neat crown with a giant Letter N on top. The illustrations show a nose, a nest, and a nail. This file has an O headband for your students to make. Graphics include an octopus, an ostrich, and an orange. P is for pig, pretzel, and pizza. Trace along the dotted lines and print the letter P on the band. A queen would look quite quaint wearing this Q crown. Trace, write, color, cut, assemble, and wear this headband proudly. The R headband has the letter R, a rooster, a rhino, and a rake. Don't get creeped out when you see spiders and snakes on your students' Letter S crowns. The T headband has a tortoise, tape, and a tomato. What pictures did we come up with for the U hat? A unicycle, an umbrella, and a unicorn. Color the vulture, violin, and the vase. Print some Vs. Cut it out, assemble, and wear it home. This is a fun one. There's a walrus, a wagon, and some waffles on the W hat. You're probably thinking, "I bet they couldn't come up with three different pictures for the X crown." You're right. We couldn't. This crown features an x-ray and a xylophone. What did we choose for the third picture? See for yourself. The Letter Y headband has a picture of yogurt, a yak, and a yo-yo. Trace and print some Ys and help your students put it together. The final crown in our letter series features graphics with a zebra, a zero, and a zipper. This crown presents the number 1. Trace the number 1 on the headband. Color the numbers on the front. For best results, print on sturdy card stock. The front of the crown has two hearts and the word "two." On the band, you'll trace the digits. Use this fun crown when your "number of the day" or "number of the week" is three! The digit 4 is displayed prominently on the front of this crown. Your students will love making and wearing this fantastic FIVE crown. Try this sensational SIX crown craft with your kids. This cute crown is decorated with SEVEN stars. This crown has EIGHT lovely hearts. 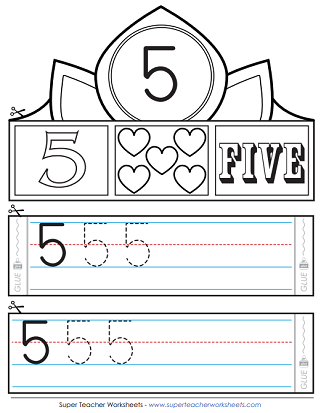 Students can trace and write the number 8 and color the pictures. Nine triangles adorn this numerical headband. Celebrate double digits! This ten crown can be decorated and cut out by students. Then attach the parts together with tape and they can wear it. Reward your star students with this totally cool crown. This black-and-white Super Star hat can be colored in before it is worn. Your class Math Whiz Kids will love sporting this adorable wizard crown. This PDF is a blackline master so your students can color it in themselves. The Super Speller headband has a picture of a yellow and black striped spelling bee on it. Color the bee and the letter on the Super Speller headband. Here's a full-color crown that you can print out. Cut it out, attach the pieces with tape, and give it to a Super Reader in your class to wear. Here's a black and white version of the Super Reader crown. Kids can color in the crowns and wear them on their heads. This headband has yellow smiley faces on it, and the words "Kindness Award." Use colored pencils to shade in the smile faces and the letters. Then assemble and wear this Kindness Award hat. The Happy Helper hat is the perfect reward for students who show exceptionally helpful behaviors in the classroom. Children can also color and make their own "Happy Helper" crown. Cut out the crown, glue or tape it together, and then give it to your birthday child to wear. We recommend you print this on thick card stock paper. This is a B&W version of the birthday crown above. Kids can color it in before they wear it. Print on card stock. Here's a birthday crown that a 3-year old student can wear. This version is full-color, so all you'll need to do is cut it out and tape the parts together. We recommend you print this on card stock. Here's a black-and-white version of the 3-year-old birthday crown. Kids can color it in. All you need to do is cut it out and tape the pieces together. Use this hat to celebrate the birthday of a child who is turning 4 years old. Print this file in full color, on card stock. This is the black-and-white birthday hat for a 4-year-old child. Kids'll have a blast coloring it in. 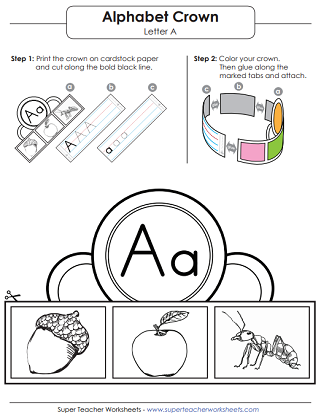 Print this full-color crown for your 5-year-old's b-day. Simply print of thick paper, cut it out, and glue the parts together. Five-year-olds love to celebrate their birthday with a crown! Color it in, cut it out, and attach the pieces together. This is the full-color version of the 6th birthday crown. Turning six is super exciting! 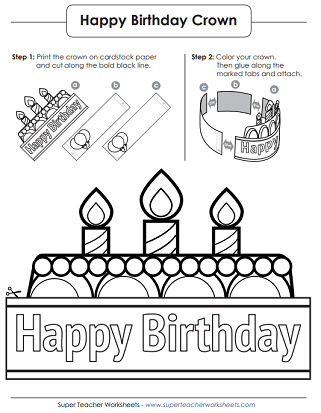 Celebrate birthdays in your class with these crown craft. Here's a full color version of the birthday crown for a 7-year-old student. This birthday hat for a 7-year-old can be colored, assembled with tape, and worn. For best results, print on card stock paper. This hat features a cheerful sun and the words, "Happy Summer!" Our Halloween crown features a smiling jack-o-lantern. This hat has the words "trick-or-treat and a spooky witch on it. The Thanksgiving crown features a turkey and pumkpins, with the words "Give Thanks" imprinted across the front. This hat has the words, "Happy Hanukkah" on it. There's also a picture of a menorah, gifts, and a dreidel. This hat craft has a picture of Santa, and the words, "I've been good!" This headband has a picture of a Christmas tree and the words, "Merry Christmas!" Kids will enjoy wearing this crown to start the new year. "Happy New Year" and "2018" are written on the front. This fun crown says, "Happy New Year" and "2019!" The front of this hat says, "Happy New Year - 2020!" Have kids color, cut, and wear when they come back from winter break. We at STW are always prepared for the future. That's why we've got the New Year's 2021 crowns all ready to go. Do you like to plan ahead? You can be the very first one in your school to have materials printed and ready for the 2022 school year. If the groundhog sees his shadow on February 2, he'll run back into his hole to hibernate. If this happens, your class can color this hat, which reads, "6 More Weeks of Winter". If the groundhog does not see his shadow, your class can color this hat. It says, "Spring is coming!" This version simply has a picture of a groundhog and the words, "Happy Groundhog Day" on it. Use pink and red to color the hearts on this cute holiday headband. Color, make, and wear a hat with George Washington's picture on it. Celebrate Presidents' Day with this cute Abraham Lincoln crown. This fun crown features "Lucky the Leprechaun." Color him green and orange. This one features a picture of the Earth and the words, "Happy Earth Day!" This headpiece is patriotic and has the words, "Happy 4th of July." This is another variation on the blank crown template. And here's yet another blank version of the crown/hat/headband template. We have lots of worksheets to go along with each letter sound. This page features early literacy activities. Includes build-a-sentence activities, word ladders, mini books, rhyming worksheets, word wheels, and more.